I´m an primary english teacher. I teach children from 8 to 12. 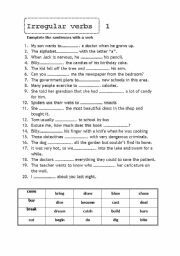 A new worksheet to study quantities and quantifiers, countable and uncountable nouns, and a little about determiners.You have a second page with the answer key. Hope be useful. This is an excel model I use with my ss to keep their progress.I hope be useful. 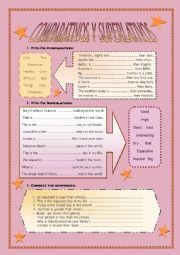 Here´s another activity to revise comparatives and superlatives for younger learners. Hope be useful! Hugs!!! 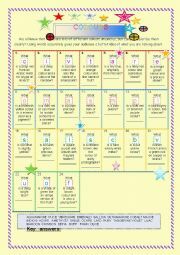 I´d like to help your students revising vocabulary about school subjects, to have got, times,days of the week,..Hope be useful. Thanks for this great website. 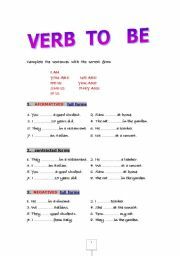 This is the first worksheet I use to revise the irregular verbs list.Students have to complete the sentences with the verbs below, and with the right tense.Hope be useful! 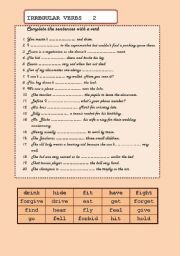 Your students can revise these irregular verbs.Hope be useful!!Hugs!! 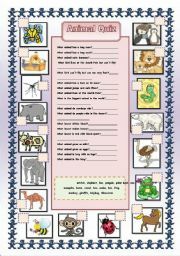 Hi, everybody!Here´s a worksheet with names of different colours. Try it. My students like it a lot. Hugs ! !Don´t worry about the preview.I´ve checked it and there´s no problem with the worksheet. 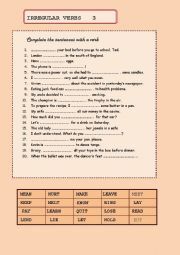 Students can revise this group of irregular verbs. 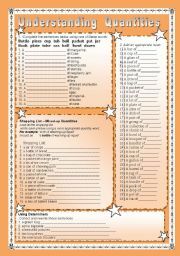 This time I´ve included the answer keys.Hugs!!! A simple revision of verb to be.